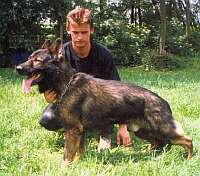 My name is Zbynek Divis.I am a veterinari doctor,breeder and trainer of German Shepherd dogs.I have been dedicated to training and breeding of German Shepherds since 1983.I worked for fifteen years as a veterinary doctor and officer for the Police Czech rep.in the kennel "z Pohranicni straze" (z PS).In this kennel we bred over 1500 puppies for Police K-9 work from 1993 to 2005. In 2005 I quit the Police and concentrated only our private kennel Aritar Bastet which we started together with my wife in 1990. Our kennel specializes in the breeding and training of working type German Shepherds dogs which are suitable for top IPO sport,Police - K9 use and protection of the family. Very important to us is breeding healthy,strong and intelligent German Shepherds that can cope in all situations necessary. The basisof my breeding program is the use of only good females from old Czech blood lines from the famous kennel "z Pohranicni straze". I have known these dogs personally for many generations and have experience with them in breeding and every day training. Police - K9 dogs.Axa was a super working female with great fiery temperament, high ball drive and real civil focus.